At Ladder, we’ve had the pleasure of working with dozens of eCommerce businesses. Every day we hear problems that founders and marketers face in building successful online eCommerce store. Very often, we find that they get caught up in finding the right tech stack. They get very excited upon finding a shiny new niche analytics tool. They spend hours on the phone with sales reps from every social listening tool available. They burn through countless free trials of software tools they don’t fully understand. We went through it in building the essential eCommerce tech stack you’ll read about below. This post is geared towards putting an end to tech stack confusion and helping early-stage eCommerce businesses get their stores off the ground and start selling their products cost-effectively. (Note: This stack also works for late-stage eCommerce businesses by removing inefficiencies). Meet the growth team that will help you build and grow your e-Commerce business. Talk to a strategist today! Which shopping platform should l use? They’re hands-down the most advanced platform for eCommerce. On the surface you might find that Shopify has similar capabilities as other players like Magento, WooCommerce, and others. It’s Shopify’s deep integration with thousands of tools that makes it stand out. Once you’re done with the basic setup for your store, Shopify will take you a LOT further than any other tool. Most importantly, it has the most user-friendly dashboard, making it super-simple to set up a store. 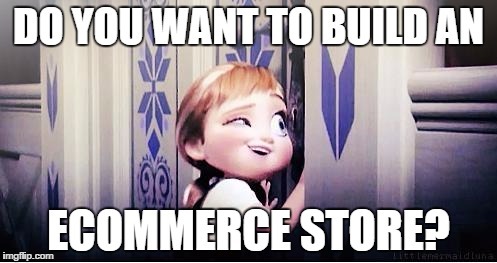 So you want to start an eCommerce store, eh? Abandoned cart functionality (more on this below). 24/7 Support: Don’t beat yourself up reading through thousands of blog posts. Hit them up – they’ll fix it. The ONLY real limitation for Shopify is if you are a subscription based eCommerce business. Shopify doesn’t actually support subscription commerce itself, though there are a number of third-party apps that enable subscription functionality on the platform. You might run into issues with those apps, and Shopify support won’t be able to help you with those. At its core, Shopify fundamentally is not engineered for recurring orders: To get a subscription product set up in Shopify, it should be created first as a one-time product. Next, the shop owner will install one of the subscription add-ons. Once the app is installed, additional settings screens will be enabled that allow recurring purchase options to be set for the product. For a subscription-based store, use Cratejoy. It’s the easiest and most advanced platform that’s purpose-built for subscription model eCommerce. Which analytics tool should I use? Don’t bother with any other tool, Google Analytics has everything you need. When connected properly to your store, you’ll be able to track product revenue and your entire eCommerce funnel. What is the total amount of purchases from organic traffic last month? What is the percentage of users from Facebook Ads who “added to cart”? What is the amount of time that direct traffic spends on the checkout page? Which product drives the most ROI on my AdWords campaigns? Do not install the Google Analytics code and sit back. GA doesn’t track events & goals out of the box. GA will never be able to track the number of times a user clicks a specific button on your page. You have to do some slightly more advanced tracking implementation to make sure that data is firing. If you have GA – but haven’t configured it in any way, chances are you won’t have any helpful data to look at. Every eCommerce business is different. That said, there are standard events/goals you’ll want to make sure you’re tracking: Product page view, Add to Cart, and Purchase. Don’t hard-code these events into your website. Instead set up “triggers” to fire these goals/events in Google Tag Manager (more on this below). This will prevent you from having to bother your developers every other minute. Which Tag Management solution should I use? First off: You NEED a Tag Management Solution. By placing just the piece of code for Google Tag Manager on your site, you will be able to free up your developers from marketing or tracking related requests. You want to fire a Facebook Conversion Pixel on the “Purchase” event. You want to fire a Google AdWords Remarketing pixel when user visits product page but does not complete purchase. Google Tag Manager outperforms the competition with its ease of use. Adding tags & events takes a few clicks, and you’ll be able to preview and test them instantly via the debug feature and without the help of your dev team. Google’s free, user friendly, well-documented, and extremely well integrated tag management solution crushes the more expensive competition. And while some features are lacking compared to more advanced tools like Segment, you’ll have almost everything you need for free in GTM. Which Conversion Rate Optimization platform should l use? What if your “Product Page View” rate was 4%, and your “Add to Cart” rate was 15% and so was your “Complete Purchase” rate? Let’s do the math — that’s almost 5 purchases every month! These incremental changes won’t just magically happen, however. Your funnel will not change if you don’t change the user experience on your website. To A/B test different website experiences and make calculated bets on what to change on your site (maybe it’s the hero image, maybe it’s the headline copy, maybe it’s the color of the “Add to Cart” button) – You need to use Visual Website Optimizer, a.k.a. VWO. It can also allow you to run some fancy, advanced tests, but this post is meant to get you set up baseline tests. Within VWO you change choose to show a version of your website to a set percentage of people. For example, you might only want to show your version B to 50% of website visitors and get a true 50/50 split on your test. But how do you know if your test is successful? You need to tie a goal to your experiment. If you’re changing the color of your “Add to Cart” button from Red to Green, you need to track the clicks on that button as a goal, and you also need to track the overall amount of purchases as another goal. You can do all of this within VWO. Which email marketing tool should I use? Great. Your store is set up and you’ve got the right tool to test what’s driving conversions. Now you need to speak to your customers and your interested prospective customers. Although we wouldn’t have recommended it for eCommerce a year ago, we now recommend MailChimp as a go-to CRM tool. MailChimp has incredibly seamless integrations with Shopify, allowing you to capture detailed purchase data from your customers that you can use to create personalized campaigns and automation workflows. Starting a 3 stage drip email campaign for any user who has signed up for your store updates. Every email campaign can directly be A/B tested within MailChimp, and every campaign can have a custom conversion event associated with it. For example, you can count “Conversion” every time a user clicks on “Redeem Code” CTA in email. As an early-stage eCommerce business owner, that’s ALL you really need. And because MailChimp is the most popular tool out there, you also have the perks of it being able to integrate with virtually any relevant online marketing tool. Which Email Capture tool should I use? True story: Some companies (not pointing fingers) will charge you up to $4000/month for email capture popups. Don’t get me wrong. You DO need email capture on your store. But you certainly shouldn’t pay that much money for it. As an eCommerce business you won’t convert every site visitor. However, you might be able to catch their email. If they’re into your brand, they will want to sign up and stay involved with new launches, discounts, and updates. These are not just emails signups, however. They are extremely qualified high-intent purchasers and/or potential customers. Capture their email – that’s your goal. You won’t be able to convince someone to give their email with a discreet call-out in your store’s footer section. However, you may be able to do it with clever popups in different formats that appear in different situations. With Sumo you can design popups however you’d like, and select parameters for them to popup in many different scenarios – all for free. Once you capture those emails you’ll want to push them to your CRM in MailChimp. Sumo supports many integrations like MailChimp, Zapier, and Hubspot, so that all of your captured emails can be pushed directly into your desired email marketing tool. Sumo also has many different templates for you to use: Smart Bars and Scroll Based Pop-ups to name a few. Which Referral tool should I use? There’s a finite number of ways you can get more customers. You can be as inventive as you want with them, but there’s only so much you can do. Paid Media, PR, SEO, Partnerships – Those are the the most common ways to grow an eCommerce business. What most eCommerce players insist on doing (for all the right reasons) is to grow a little faster with every new purchase. They do this by setting up referral programs — automated ways to encourage people to make referrals to their business. DropBox: Refer a friend, get extra storage space. We recommend using ReferralCandy – It’s very easily integrated with Shopify stores and can be set up extremely efficiently. Referral programs in general can be tricky to setup and monitor, but ReferralCandy relieves you from all that pain. And it helps that their support team is extremely responsive and helpful. BONUS: How do I get these apps to talk to each other? Put it all together with Zapier. Soon enough you’ll have an expanding tech+growth stack, and you will want all of your tools to communicate with each other. Think “If this then that” systems. Use Zapier. It’s by far the best tool out there to manage integrations. Their support team is award winning and their technology is extremely easy to use. All of this and an infinite number of other integrations without any developer support. As they say, “Zapier is the glue that connects more than 750 web apps”. Not bad at all for the return on investment you’ll get from each! Venture Capital Analyst @ Passion Capital | MBA Candidate @ Cornell University | Prev. Senior Growth Strategist @ Ladder working full-funnel and cross-platform to solve growth problems for eCommerce, SaaS, and App businesses.